Mr. Adamian oversaw tremendous growth of Bentley College in Waltham. When a drunk driver killed his first wife and almost killed him in January 1966, Gregory Adamian faced his grief the way he tackled most everything during his life, friends said. He sought a way to help others by trying to prevent a future tragedy. Mr. Adamian, who was president for 21 years of what is now Bentley University, brought a landmark lawsuit against the owners of the tavern where the driver became intoxicated, drove away, and crossed the center line on Route 2. The case resulted in a state Supreme Judicial Court ruling in 1968 expanding bar owners’ liability for patrons. After the crash, while raising two sons, Mr. Adamian devoted himself to transforming Bentley College. Once a small accounting school in downtown Boston, it became a respected liberal arts college offering a top business education and changed its name to Bentley University in 2008. Mr. Adamian, who was Bentley’s first chancellor and a leader in the Armenian community, died Nov. 21 in his home in Medford. He was 89 and had been treated for cancer and an infection. “He was committed to his ethnic identity, to his work, to his family, and to his church,” said the Rev. Dajad A. Davidian, retired pastor of St. James Armenian Church of Watertown and a friend since childhood. 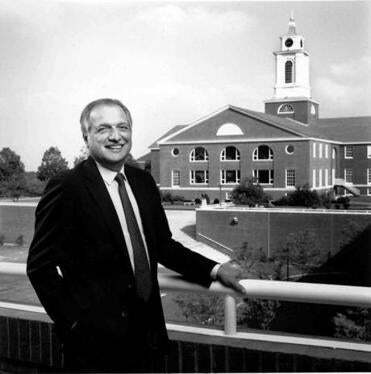 As Bentley’s president from 1970 to 1991, Mr. Adamian oversaw dramatic growth, according to the university. The college’s endowment increased from $385,000 in 1970 to $60 million when he stepped down as president, enrollment doubled, and the faculty grew from 42 to 350. “It all goes back to his foresight in developing the institution,” Smith said. When Mr. Adamian took the helm after many years of teaching economics and legal courses, the college had just moved to its Waltham campus. Mr. Adamian oversaw a building boom. After he became president in 1970, the college added 27 buildings, including residence halls, classrooms, and athletic facilities. His energy as president and zest for life were infectious, colleagues say. “I was determined to live,” he said in the 1990 interview, recalling how he had been treated for kidney cancer in the 1960s. Mr. Adamian was devoted to his Armenian heritage. The families of both his parents immigrated to the Boston area during the Armenian genocide. Born in Somerville in 1926, Gregory H. Adamian grew up speaking Armenian. The family moved to Brooklyn before settling in Watertown. His father, Adam, was a typesetter at an Armenian newspaper, and his mother, the former Sandy Martin, was a homemaker. He graduated from high school at 16 and went to work at Hood Rubber Co. in Watertown, where many Armenian immigrants found factory work, according to historical accounts. During World War II, Mr. Adamian secured permission from his parents to enlist because he was not yet 18. The Navy sent him to Harvard College, from which he graduated in 1947, and officer’s training school. He later served in the Pacific, according to his family. After the military, Mr. Adamian graduated from the Boston University School of Law on the GI Bill and opened a law office in Harvard Square. Business was slow, he told his family, so he enrolled in public administration at Harvard University and graduated with a master’s in 1952. He married June Mouradian in 1958. She was 27 when she died in the crash. When Mr. Adamian was offered a part-time teaching position at Bentley in 1955, he had never heard of the school. “Bentley? I thought that was a car,” he said of the place to which he would devote his professional life. “Bentley was in his blood. There isn’t anything he wouldn’t do for Bentley,” said his wife, Deborah. Deborah Murdza was teaching business seminars at Bentley in the early 1970s when friends introduced them. They were married 37 years. In addition to his wife, Mr. Adamian leaves his two sons, Douglas of Branchville, S.C., and Daniel of Dallas; and five grandchildren. A funeral service will be held at 1 p.m. Monday in Saint James Armenian Church in Watertown. Burial will follow in Mount Auburn Cemetery. Mr. Adamian was recognized several times for his dedication to Armenians. He was named Armenian of the Year in 2012 by the Eastern Diocese of the Armenian Church of America. The leader of the Armenian church, his Holiness Karekin I, presented Mr. Adamian with one of the church’s highest honors, the St. Sahag-St. Mesrob Medal, in 1998. In 1958, Mr. Adamian testified before the US Senate in an effort to win support for legislation increasing the number of Armenian refugees admitted to the country. The organization Facing History and Ourselves presented Mr. Adamian its Humanity Award. Mr. Adamian also was a charter member of the National Association for Armenian Studies and Research, which began at Harvard in 1955 and held early meetings in his law office. “There is no way to adequately state the important leadership role Greg Adamian played for NAASR and for the Armenian community, and, indeed, for the academic community as well. His contributions were matchless and his legacy is immense,” Marc Mamigonian, the association’s academic director, said in a statement. Nancy Kolligian, who chaired the association’s board for nine years, called Mr. Adamian a key mentor.